Data shows bitcoin most overbought since 2017: parabolic phase or impending crash? Bitcoin is currently at its most expensive levels in 2019. According to the GTI Global Strength Indicator—a technical analysis tool that gauges intraday crypto volatility, bitcoin is currently in ‘overbought’ territory—suggesting it could be entering a “parabolic phase,” or be prepared for another downturn. After a year of crypto winter, it seems that the market is finally thawing. While many have expected a spring rise in cryptocurrency prices, few could have predicted such fast-paced growth since the beginning of 2019. However, the rapid rise might not be good news. According to the most recent data from the GTI Global Strength Indicator, the rise could indicate impending retracement, or worse. Bitcoin is currently at its most expensive levels since just before the cryptocurrency crash of 2018, after it broke above $5,000 for the first time in November of last year. The GTI Global Strength Indicator showed that the coin was the most overbought during its run-up to nearly $20,000 in December 2017. “Now it’s a question of duration and I suspect when you have such a massive bubble, you’ll always have an overhang of people who need to sell,” he said. 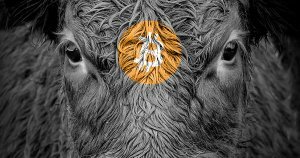 What Does this Bull Run Mean for Bitcoin? 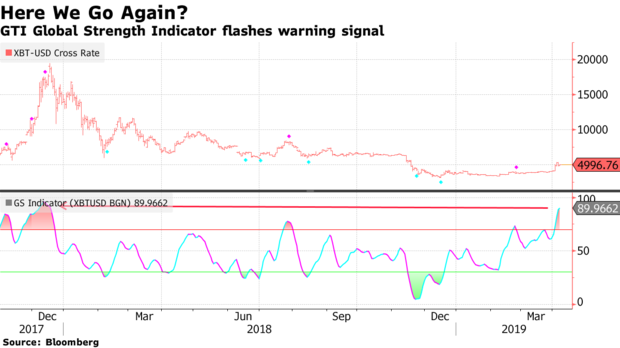 While the surge in bitcoin’s price might spell profit for traders and short-term investors, many experts have questioned whether or not the gains are salient. An overbought position often correlates to price drops as the market gets more and more saturated. Related: Following bitcoin’s 19% surge, crypto explodes: bull market in the works? The last time bitcoin was overbought this much, it plummeted down from its all-time high of $20,000 in December 2017 to around $6,000 in February 2018. David Tawil of ProChain Capital said that Bitcoin’s price surge isn’t a particularly comforting development. He expects this rally will be followed by another downward leg. Meanwhile, Peter Brandt, an author and well-known commodity trader, speculates bitcoin could be entering another “parabolic phase.” This means that the world’s largest coin could be set for another massive bull run, possibly even larger than the one that happened in 2017, as suggested by Brandt. And while many other prominent figures in the crypto industry have voiced their opinions on the current market situation, there doesn’t seem to be a consensus among them. Some are saying that bitcoin is yet to bottom out, predicting a drop below $2,000, while others believe that BTC breaking above its $6,000 “psychological barrier” is slated to happen soon. Bitcoin, currently ranked #1 by market cap, is up 3.49% over the past 24 hours. BTC has a market cap of $91.34B with a 24 hour volume of $17.55B. Bitcoin is up 3.49% over the past 24 hours.